Many of us show a wide range of emotions, and it is typically in response to some stimulus around us. There is a neurological disorder, however, that causes individuals to experience uncontrolled episodes of laughing and crying. These individuals may not feel the emotion on the inside that matches the expression they are showing to the rest of the world. This condition is known as Pseudobulbar Affect, and it affects almost 2 million people in the United States alone. Fortunately, Nuedexta is a medication that can help those individuals when they suffer from the symptoms. Pseudobulbar Affect (PBA) is not fully understood, and doctors don’t know why individuals suffer from this problem. What is known is that many people who do suffer from it have experienced a brain injury in the past. Also, there may be certain neurological conditions that could make it more likely for individuals to suffer from PBA. These would include problems such as a stroke, ALS, and similar diseases. At times, however, PBA may occur for no reason at all, and it leaves an individual struggling with the laughing and crying episodes they are now displaying. If you or a loved one suffer from PBA, there is help in the form of a medication known as Nuedexta. It is essential to understand that Nuedexta is not a cure for PBA, although it did remove all of the symptoms in many individuals who took a clinical trial. Even if it only serves to lessen the uncontrollable laughing and crying episodes you are experiencing, it can certainly improve your quality of life. Nuedexta has been approved for use in treating PBA by the FDA. It is only available with a prescription that comes from your doctor. There are two different drugs in Nuedexta that work together to help reduce the symptoms that you are experiencing. Dextromethorphan works in the brain, which may be why it has the desired effect for individuals who suffer from PBA. What is interesting is the fact that Dextromethorphan is a medication that is commonly prescribed for individuals who have a chronic cough. It helps to suppress a cough by keeping the brain from triggering the coughing reflex. Quinidine is the other active ingredient in Nuedexta. It is not included to treat the condition but instead, it helps to reduce some of the side effects that may be associated with using dextromethorphan. Your doctor will give you specific instructions on how you should take Nuedexta to get the most benefit from it. Typically, it is taken with a full glass of water, but it is not likely that you will need to eat it either with or without food. You can just take it when it is convenient, provided you take it according to your doctor’s instructions. After you take Nuedexta, you need to remain in an upright position for at least 10 minutes. If you were to lie down within the first 10 minutes after taking the medication, it is possible that you could experience specific side effects. Additionally, your dosage may start out at a lower dose to reduce side effects that could be associated with the medicine. Over the course of a week or so, you will continue to take stronger and stronger doses of Nuedexta until you are at the desired prescription. There is a lot of confusion over Pseudobulbar Affect and what exactly it is that causes it and causes an individual to laugh or cry uncontrollably. It is important to recognize that it is not a form of depression. Also, it is not part of your natural neurological condition, and if you suffer from the disease, it does not mean that you are going crazy. Understanding these factors can help you to be more confident in yourself and appreciate the benefits that Nuedexta will bring to you. Talk to your doctor about using Nuedexta if you suffer from Pseudobulbar Affect. It is not a cure for the condition, but when you take it according to your doctor’s instructions, it may help to reduce your symptoms and improve your quality of life significantly. PseudoBulbar Affect (PBA) is a neurological condition which affects a surprising number of people. It can sometimes occur as a result of a brain injury or can be a side effect of another disease. PseudoBulbar Affect causes uncontrollable laughing and crying, which can come on suddenly, and can occur frequently. A person suffering from PBA may laugh or cry even if they are not amused or sad. Sometimes, they do feel the emotion that they are displaying but not to the extent which they are showing it. This suffering is something that many caretakers or loved ones struggle with when it comes to people with PBA. There are almost two million people in the United States alone that have been diagnosed as suffering from PBA and more than seven million people who have symptoms which are suggestive of the condition. PBA sufferers are often people who have had a traumatic brain injury, but they can also be people with Alzheimer’s disease, multiple sclerosis, ALS, Parkinson’s disease, or stroke victims. The condition is characterized by exaggerated emotional expression. It means that people have complicated and hard to understand responses to things they see or experience. They struggle with excessive expression of emotions. They may appear incredibly happy even if they are not, and may seem depressed, yet they are glad. It is essential to understand this difference. PBA is a condition which is classed as being ‘neurologic.’ That is because it is caused by some damage to the central nervous system. In contrast, depression is a psychological condition which means that the cause is not damage, but an imbalance that alters the sufferer’s mental or emotional state. Some people who have PBA are also depressed. The two are not linked, although the difficulties in coping with PBA can compound the impact of the depression. The two conditions should be managed as separate ones. The impact of PBA is something that can be far-reaching. Usually, someone who has PBA will also be struggling with another neurologic condition, and this means that it can be even harder to cope with the difficulty of the situation at hand. It can be frustrating to have an episode of PBA in public. This frustration is caused because while the condition is a common one, it is not something that a lot of people are well educated about so having someone comfort you while you are crying may be frustrating if you are not actually sad. Having an episode of PBA which includes laughing may be embarrassing if it occurs at an inconvenient or inappropriate time. Managing PBA starts with getting an accurate diagnosis. Not all episodes of laughing or crying are associated with PBA. Some people experience those symptoms for other reasons such as depression or PTSD, or even bipolar disorder. However, sometimes episodes that are associated with PBA go undiagnosed for a long time because it is assumed that they are related to something else. If you, or someone that you take care of, is suffering from stress because they are crying or laughing unexplainably, or they are suffering from sudden outbursts of crying that are hard to explain, then talk to a doctor. 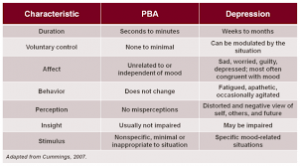 Even if there is already a diagnosis of depression, raising the idea that they could be PBA is a useful starting point for a discussion. It is hard to treat PBA, but educating the people that you spend the most time with will help to take some of the stress and frustration away. There are some other options, too. If you find that you are about to have an episode, then you might be able to stop it by forcing yourself to focus on something else. Some people find that sitting down (if they are standing) or walking around (if they are sitting) can help to control their frame of mind. Massaging any tense muscles and taking long, slow deep breaths can also help with managing an episode. You won’t be able to stop every attack, but even controlling the situation until you can make it to a private place could help to make the attacks feel less stressful, and keep things more manageable for you in the short term. There are many different types of neurological disorders that you may develop over time. Some of them are going to be genetic, whereas others are based on environmental influences. You will need to see a doctor that can help you understand what it is that is afflicting you. Many of these disorders of the brain are common, whereas others are very rare. 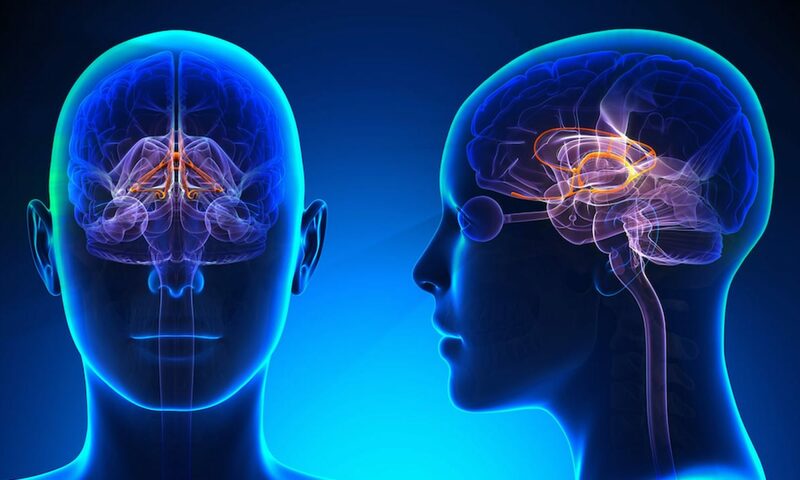 Here is an overview of the different types of neurological disorders that you may develop, and the potential cures and treatments that many scientists have come up with over the years. These are diseases that will affect your body through your brain, nerves, and your spine. Modern science has documented 600 different diseases. Most of them are going to impact the nervous system, specifically in the brain, leading to conditions such as Parkinson’s disease or epilepsy. Although some of them are the result of genetics that have been passed down from generation to generation, others are the result of the way you have lived your life or components of your surrounding environment. Let’s go over a few of the more common ones, and the treatments that may be available for people that are suffering from these conditions. Epilepsy is a condition that is characterized by seizures that a person will experience. Nerve cells within the brain go through abnormal activity, affecting the neurons in the brain. There have been 2 million documented cases of epilepsy, with as many as 150,000 more coming out every year. There are many different causes for this condition which will include an imbalance in your neurotransmitters, abnormal nerve connections, and it may also develop after someone has had a stroke or head trauma. Doctors will recommend going through an MRI and PET scan, plus an EEG will also be used to diagnose and treat this condition. Treatments will include brain surgery, medications, as well as neurostimulation procedures. Some people have gone through clinical trials for different pharmaceutical remedies that have shown great promise which will include anticonvulsants such as diazepam and many others. This is a progressive and chronic disorder that can affect the movement of an individual. Once it starts, it will progressively get worse over time. About 1 million people in the United States have this condition. The cause of this disorder is not known. There is also no cure for this disease. There are, however, treatment options available to deal with the symptoms of this disorder. Symptoms will include tremors, slowness of movement, rigidity in your trunk and limbs, and is thought to be the result of a loss of brain cells that are related to physical movement. This is the most well-known form of dementia, one that is characterized by a loss of cognitive abilities such as memory loss. For those that do have dementia, a persistent and chronic disorder that impairs memory and reason, most of them have Alzheimer’s. It should be stated that this is not a regular part of aging, and only affects a small percentage of adults that reach the age of 65 or older. It is because it worsens over time that medical science has been trying to identify it’s cause and eventually come up with the cure. MS is a condition that is also chronic and can become extremely progressive. It causes damage to what are called the sheaths of your brain’s nerve cells, and even those in your spinal cord. 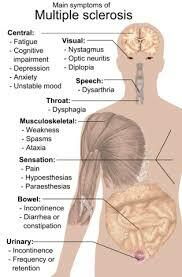 The symptoms of this condition begin with numbness, followed by speech impairment. People will also become severely fatigued, develop blurred vision and loss of muscular coordination. This is another condition for which medical science has no answers. It is thought that it is hereditary, and they have even ventured to believe that smoking might be a probable cause. Regardless of how it starts, because they have no clear answer as to what is causing it, there is no specific treatment that cures this condition. People will receive medications to help with the symptoms such as beta interferon treatments and even steroids. Until they can identify what causes this, they will not be able to come up with the cure but will continue to treat the symptoms through basic treatments such as Botox, tranquilizers, and muscle relaxants. These are just a few of the more common neurological disorders that exist. Hundreds have been identified over the decades. Treatment options are available for some of these diseases while only an effort to manage the others is possible. In the meantime, medical science is continuing to work on potential treatment options. There is no guarantee that anyone will ever develop these diseases. It is something that could happen but only occurs in a small percentage of the population. As medical science continues to progress, it is likely they will be able to identify the causative agents that lead to their development and will subsequently find a cure for each one of them. Hello and welcome to Neuronhealth.org. We are happy to have you here. Our goal with the site is to talk about brain health including neurological conditions that affect it as well as treatments to combat those diseases. We will be discussing ways to improve memory and cognitive function. These methods can include food, activities, games, and even exercises. We will also be discussing neurology and conditions of the brain such as Alzheimer’s and dementia, Multiple Sclerosis, Psuedobulbar Affect also known as PBA, and other diseases. In those discussions there will be information about treatments being made available to help those afflicted with those conditions. If you are interested in learning more about the health of your brain for a peace of mind, come back and see us. We will continue to add to the site to give you the information you want and need for a healthy noggin.